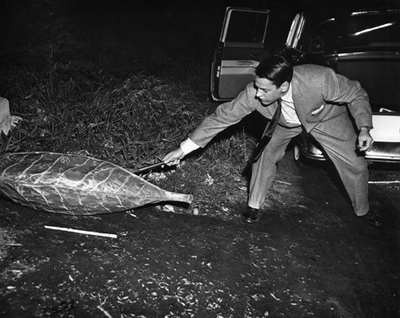 Before Invasion of the Body Snatchers was published in book form in 1955, writer Jack Finney serialized The Body Snatchers in Colliers magazine. That’s where producer Walter Wanger first saw it and brought it to the attention of Allied Artists film studio executives. The script was very close to the novel with a few exceptions, the main one being the ending. In the book the ending is entirely different by way of tying up the loose ends and bringing about a definite conclusion to the crisis facing the town. The way Siegel and Mainwaring did the movie was too bleak for the studio executives so they made them change it, and that’s the ending we see today. Siegal, along with Wanger hated it and yet he and Mainwaring did what the studio wanted. To make it jive better with their script, they added a change at the beginning with actor Kevin McCarthy telling the story to what appears to be a psychiatric doctor. It also should be said that this script was smart, realistic (for the 50s) and adult. Watch for the scene when Dr. Bennel and Becky talk about their marital status. They both say they made “a trip to Reno.” This was the polite way of saying they were divorced in a world where this was not as common place as it is now. Both McCarthy and Wynter share a nice chemistry and although Wynter was born in Germany and educated in England, you would never know it to hear her speak. Siegel, along with future director Sam Peckinpah, (who was the dialog coach and also had a few cameos in the movie) were able to get the dialog in this movie moving along at a natural pace. Also the details of the small town life, the wonderful use the city of Sierra Madre, which was then a tiny town, and it’s town folk for the extras was not only a money-saving idea, but also served to make it more believable and realistic. The story in the book is set in Mill Valley, where the author lived at the time. The actual town used for the scenes in the movie (called “Santa Mira”) was Sierra Madre which is close to Pasadena. To make the duplicates of the ‘Pod’ people the cast had to make full-body plaster molds which was not a very fun experience. They had to sit in tubs of plaster-cast material that actually heats up as it dries with straws in their noses and mouths. The studio chose the title Invasion of the Body Snatchers to differentiate it from an earlier Boris Karloff movie The Body Snatcher which was the real title of the book. Siegel hated the title and asked Kevin McCarthy if he could come up with a better title. McCarthy, fresh from Broadway and the stage chose a line from a Shakespeare play and suggested Sleep no More, but the studio quickly shot that down. 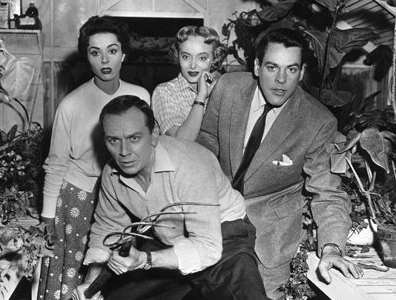 McCarthy says in an interview for the book “They’re Here” (a tribute to the movie) that perhaps the studio was trying to cash in on the success of It Came From Outer Space. Filming took only 19 days and cost the studio $300,000. No second unit was used and many scenes were filmed in real locations (houses, a restaurant, Bronson Canyon in Griffith Park, and a highway in L.A.). So much as been written about this fine movie with regard to how it’s a metaphor for the communist scare of the 1950s, yak yak yak, blah, blah, blah. How many times have I heard or read that boring drivel. In fact, I think the meaning of the film is much simpler and therefore deeper than that. Writer Jack Finney said it was about conforming. He also deplored what he thought of as the loss of small-town life and these two themes are in many of his short stories and books. It’s sad to think this great film with its profound message of what conformity really does to people should be reduced to a parable about the communist witch hunts of the 50s. In a way, this treatment is exactly what the movie is against. Socrates said “The unexamined life is not worth living.” This message and this belief fortunately will never grow stale. Yet another film version of Invasion of the Body Snatchers was released in 2007 called simply The Invasion and starred Nicole Kidman and Daniel Craig. Editor's note: In case you have never seen the movie, you should know that on IMDb, the film warranted a 7.8/10, after 31,000 votes have been tallied up.